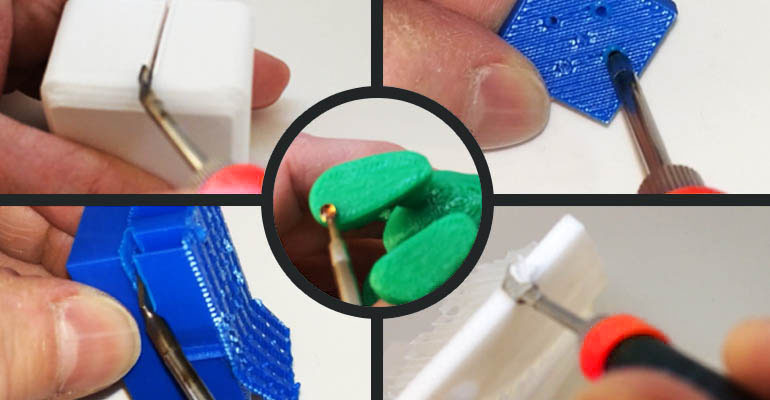 The MODIFI3D is a tool for repairing and post processing your 3D Printed objects. Remove supports, rafts, and brims, repair imperfections, and weld parts together. Check out the video below for information on how it works. Heated 3D tool with specially coated interchangeable tips designed to FINISH, REPAIR and MODIFY 3D printed parts. Needle, knife, scoop and point tips. Special tip coating to prevent sticking. Rapid heat up in less than 15 seconds. Sleep mode if not used for 25 seconds. Lightweight, compact and easy to use. Touch switch and indicator light. USB powered (USB 2.0 or USB 3.0). 3D printers are fantastic things! Producing some great looking parts straight off the printer. However, if you actually own a desktop 3D printer you will know that this isn't always the case and all kinds of printing errors can creep in. Removing support material can sometimes be a pain and what if you need to modify the part after printing? You won't want to print the whole thing again if it can be avoided!... This is where the MODIFI3D Finishing Tool steps in. MODIFI3D offers a low cost solution to Finish, Repair and Modify 3D printed parts. MODIFI3D is a heated tool with specially coated interchangeable tips designed to finish, repair and modify 3D printed parts. MODIFI3D Is designed to replace much of the sanding, scraping and snapping to finish off your 3D prints. The pen like form of MODIFI3D makes it very comfortable to use and extremely easy to control when precision is important. MODIFI3D works with PLA, ABS and other 3D printing materials. Heats up to 300ºC (572ºF) in less than 15 seconds. Finishing 3D prints should be easy and never a chore. Simply plug in the USB, touch the switch and in less than 15 seconds you are ready to go. You will be able to remove any unwanted material or modify your print without having to redesign and print again! Place MODIFI3D on its stand and in 25 seconds it will go into sleep mode (a basic stand is included but you can print your own stand/tool holder with our downloadable 3D file). 1. Remove the protective cap (if used) and place MODIFI3D on the included stand. 2. Plug in the USB (USB 2.0 or 3.0 recommended). 3. Touch the metal switch to start heating. A red light indicates that MODIFI3D is switched on. 3. In less than 15 seconds MODIFI3D will reach around 300ºC (572ºF) and is ready for use. To increase the temperature or reach the maximum of 420-450ºC (788-842ºF) continue to touch the metal switch until the required temperature is reached. 4. If MODIFI3D is not used for 25 seconds it will go into sleep mode (light will go out and the tip will start to cool). To wake MODIFI3D just gently touch the switch and the heating process will continue. 5. Always unplug the USB if MODIFI3D is not being used. 1. To change tips unplug the USB and allow to cool fully. 4. Plug in the USB... Easy! Over time you may want to clean the interchangeable tips. We recommend using a damp sponge to remove any plastic or residue from the tips. This works best whilst the tips are still warm (but obviously not hot enough to pose a risk of burning). Please ensure that the USB is unplugged and the tips have cooled to a safe temperature. Do not use abrasive cleaning products. This can damage the special coating on the tips. Interchangeable tips make it easy to choose the right tool for the job. Cutting and removing sections including the removal of supports, brims, and rafts from your 3D print. Includes special coating to prevent plastic sticking to the tip. Great for clearing small holes and features or for detailed layer refinements in hard to reach places. Includes special coating to prevent plastic sticking to the tip. General purpose tip for larger internal features and holes. Can even be used for making holes after printing! Includes special coating to prevent plastic sticking to the tip. Prefect to remove stringing and imperfections from inside holes or recesses. Can also be used to blend surfaces. Includes special coating to prevent plastic sticking to the tip.